This month the gals at the #CreativeCookieExchange are baking up cookies that pack well to go on a picnic. For packing purposes, make cookies the same size by using a specific scoop or measuring device. Packing them can be as creative as you'd like! For me, putting cookies in an old fashioned ziplock bag is my favorite way to carry them. They stay dry and airtight, plus can be packed at the end since their loose form will settle into any contour of the basket. 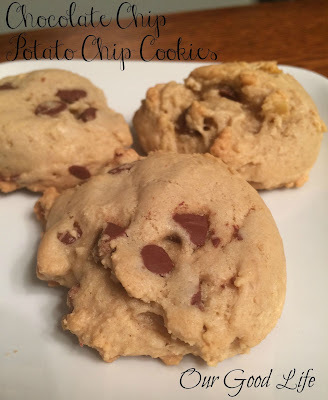 My treat is a chocolate chip potato chip cookie. I love the sweet/salty combination of this cookie. I use kettle chips as they can stand up to the moisture of the batter a bit easier. If you really wanted to knock it out of the ball park, then try salt and vinegar chips! Whisk together flour, soda, salt and nutmeg. Melt butter, cook until browned. Skim off solids and remove any dark spots. Beat melted butter and sugars together. Stir in flour mixture, 1/4 c at a time. Bake 12-14 minutes. Cookies should be set but not brown. order them for yourself, you can get them here. I used the baking sheet for the cookie sheet liner. I loved this product, too. So easy to use, it can be cut to size and is so easy to clean! So much easier than the cookie sheet! This sheet can be used on the grill, too! It keeps veggies and smaller meats like shrimp from falling through the grate. Awesome product. You can get it here. Loved this mat and these would make great Christmas gifts, too! Check out these awesome picnic cookies by the other bakers at #CreativeCookieExchange!